The Laguna Board of Realtors and Affiliates Charitable Assistance Fund served up a tasty combination of art and eats on Wednesday at Tivoli Too – all for charity. Funds raised at the 23rd Annual Taste for Charity will benefit nine local nonprofit organizations and the Laguna Beach High School Scholarship Fund. “We are so blessed to be involved in this event,” said Carol Carlson, director of the Laguna Beach Youth Shelter, one of the beneficiaries. Beneficiaries selected this year also included the Laguna Beach Community Clinic, Laguna Food Pantry, Laguna Beach Live!, Laguna Beach Seniors Inc, Laguna Plein Air Painters Assn, KX93.5, the Laguna Board of REALTORS® and Affiliates’ Charitable Assistance Fund and No Square Theatre. The Plein Air Painters gave their thanks in 11 donations to the live art auction. Donors included such well-known artists as Jacobus Baas and Tom Swimm. Wednesday’s event also featured unlimited samplings of some of the signature dishes on the menus of the participating restaurants: Gelato Paradiso, Ivory, GG’s Café Bistro, Laguna Beach Brewery and Grille, Mozambique, Royal Hawaiian, Skyloft, Starfish, Taverna by Lombardi, The Cliff, Ti Amo by Il Barone, Rooftop Lounge & K’ya Bistro, Carmelita’s Kitchen de Mexico and Tivoli Too. Proceeds and the dispersion to beneficiaries were unavailable at press time. 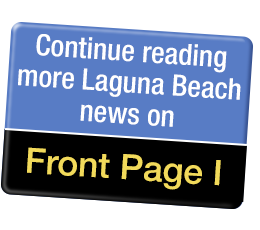 The event was sponsored by the Laguna Board of REALTORS®, the Affiliates’ Charitable Assistance Fund, Wells Fargo, Villa, Pacific Sotheby’s, Corner Escrow, Compass and Surterre Properties.